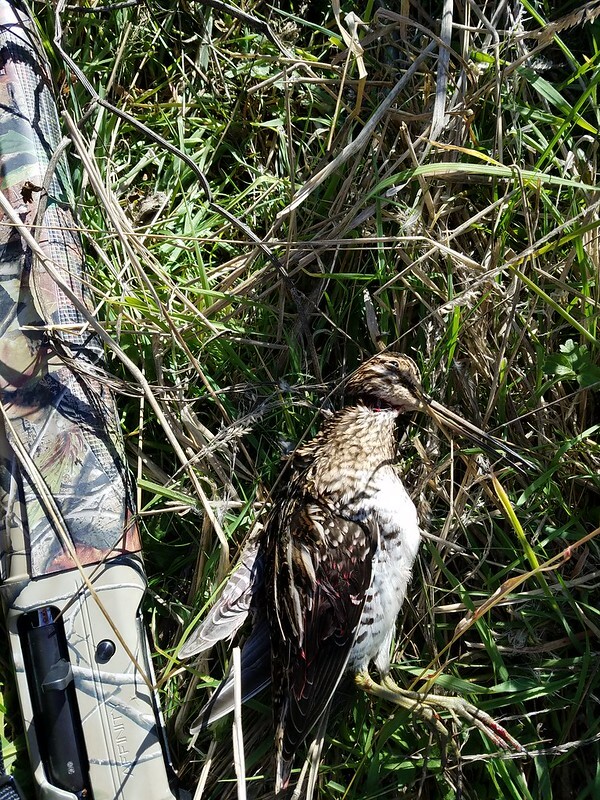 Wilson's Snipe: New Hunter initiation Success! I was told by some hunter friends to get a Snipe as my rights of passage. A tradition that all new hunters must do. Jokes on them? Re: Wilson's Snipe: New Hunter initiation Success! Congrats! In 15 years checking hunters I think I only checked 2 parties that were snipe hunting, and field-checked one snipe (Wyoming). I semi-deliberately hunted them once when I saw them along a small stream, shot one and got my rite bird. Nice, was this a the Ebey Island release site? I had one blow up about two feet away from me this weekend and didn't make the connection that it was a snipe until out of range. That snipe will make a nice meal for the family on Thanksgiving. Be sure to stuff it first. Oh but this Snipe is to be saved for Tiny Tim's Christmas dinner! God bless us, every one! Mark - That's the spot, you are correct. I don't have a hunting dog so I just hunt close to home and work it hard. 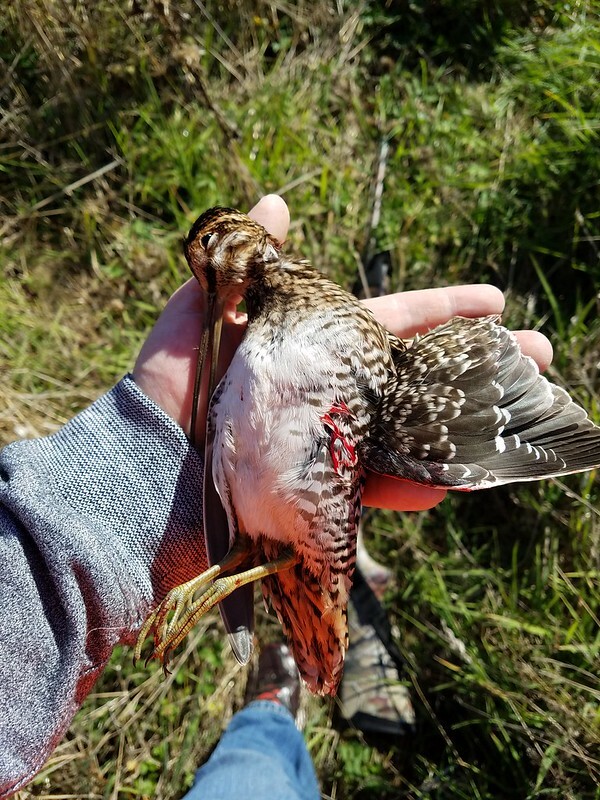 I have pretty broad tastes in game, but about the nicest thing I can say about snipe as table fare is better than merganser, and not as much to eat as woodcock! Can they be hunted with an upland dog, or is it best to hunt them solo? I know it's weird, but I've always wanted to. I jump them at low tide in salt marshes all the time, so it seems like it would basically be marshland upland hunting. I grew up on the East Coast and we used to hunt woodcock/timberdoodle. Hard to hit and they would launch straight up first while being very close to you and scare the "censored" out of you. Not bad eating but it takes a lot of them to make a meal. It was pretty rare that we came home with enough for a meal. 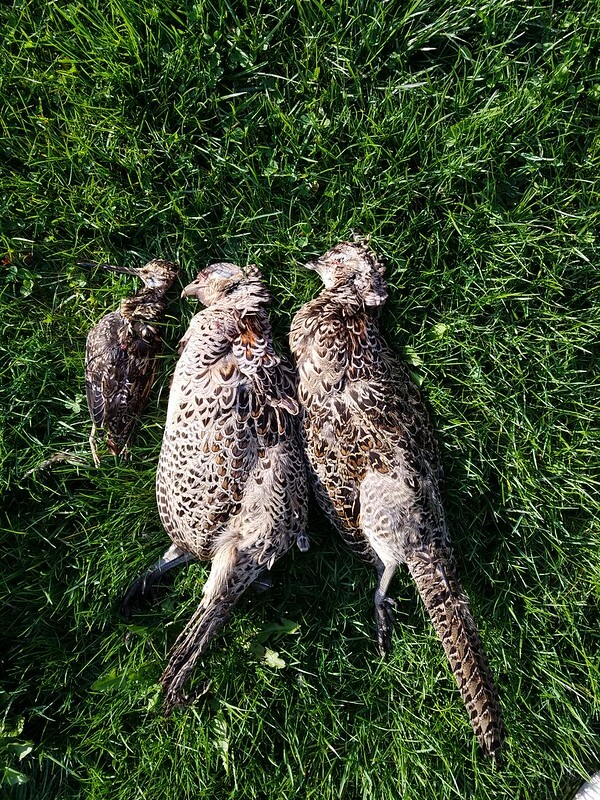 Normally got a few grouse too that filled out the fare for dinner. These snipe look very close to the woodcock in size. First time I saw one I thought it was a woodcock but I knew they did not migrate this far west. We took many unsuspecting victims out for a nighttime "snipe hunt" that were hilarious. We would have some beating the bushes and yelling and others waiting for the "snipe" to run out of the ravines into an outstretched burlap bag. One night someone did catch a skunk. Just checked the regs and they can only be hunted using a non-toxic potato sack and a flashlight! Myself and some other guys I knew in the Midwest had a spot that would attract both Woodcock and Snipe. We ran pointers on them during the quiet season with success. Given how well they are camouflaged they both taught the younger dogs to use their noses. I have three of these snipe in my yard every day. Fun to watch as they work for worms. They first appeared last year and I initially thought they might be lost woodcock. This year only one showed up and I thought the others must have died. Two weeks later the other two showed. They hang out most of the day and have scared the *&%&* out me when I went out on the deck several times and they launched close to me. My shorthair has been enjoying their arrival and seems to recognize that they are a gamebird. Are you sure those aren't Killdeer? I have killdeer also that are here daily but these are definitely snipe. cool! I have a buddy who is a writer from England. Writes for mags about high dollar double guns. First time we were hunting in my local childhood haunts, a snipe gets up. He looked at me like I was crazy that I didn't shoot. I was then educated on how snipe are one of the great game birds. Since then, we shoot a bunch of them, often 8-10 a day and they are great! Fillet mignon on the wing!